After a two-day rest from farming, I resumed my attacks against the Villages on my raiding list. At least in my mind, I have given them a chance to survive this long and protracted war. For two days without a raid coming from my Village consequently they would have had one less farmer to contend with. Not that these Villages would have to thank me for not raiding them for the past two days, but the lull would have given them a brief sigh of relief, and thus they could have upgraded some of their respective Villages resource fields which, in turn, would give more opportunity and more gain for farmers like me. 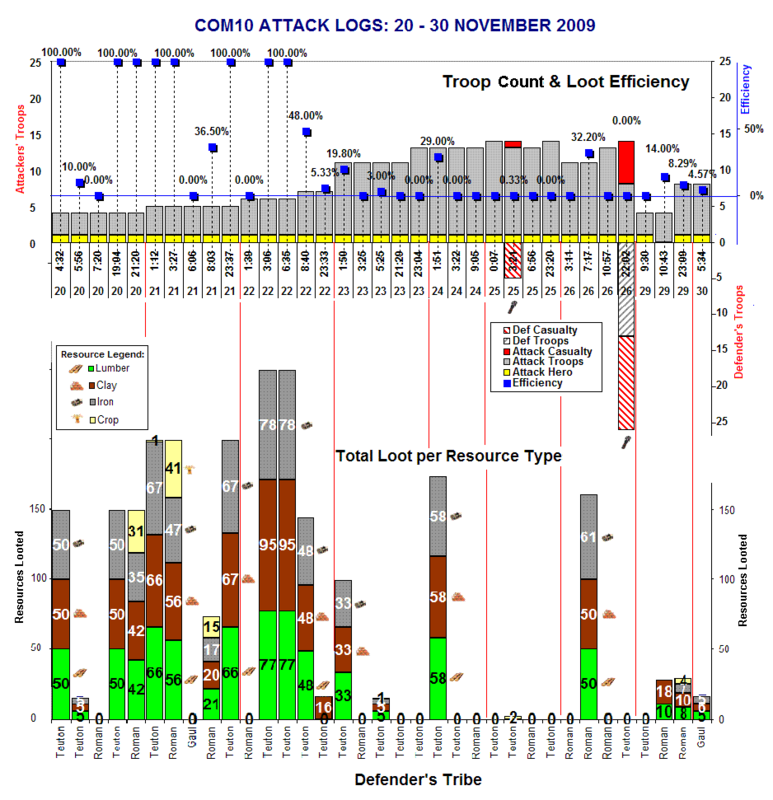 The figure shows the graphical Attack Logs of my Village from 20 to 30 November. The panel above shows the relationship of Loot Efficiency versus the number of Attacking Troops from my Village and those defending the attacked Village. The panel below shows the stack of loot per resource type taken from the Defenderss Village. I have not created additional troops since my last raiddecimating half of my troopsbecause I have given higher priority to upgrading my Villages military installations. With crop production seemingly too small to sustain the upgrades and with my resource fields still diminished as a result of my self-imposed strategy of not upgrading most of them until I have all four  Crannies to level 10, three already up and one to go, I resolved to balance the troop upgrade and the levelling up of existing military installations. Thus, although the number of my troops remained the same, they are now equipped with stronger weapons and more impenetrable armors. It was rather fortunate that no incursions to my Village was waged for the past two days. Probably, with my Alliance comrades within my 7×7, except for one or two, as well as the Alliance rank going up the list, plus the fact that our Alliance profile boasted a list of players accounts deleted by our concerted attacks; most Teutonic attackers were wary of coming within our sphere of influence. The first raid for this day was against a Teutonic Village, which our Alliance have been attacking for sometime now. My raid gained nothing but lost time and effort. The second raid was promising. Waged against a Roman Village, it rewarded my troops with 10 (wood) and 18 (clay). Still no (crop). Repeating the attack on the same Village ten hours thereafter, with more troops raiding, the loot: 8 (wood), 10 (clay), 7 (iron) and 4 (crop)! Although the amount was minimal, as a consolation it was a start of a fruitful one-sided benefit. Prior to signing off, I upgraded the Academy and the troopss Armors and Weapons, and sent out all my troops to my third incursion to a Gallic Village but was hoping that nobody will try to attack my Village while my troops were out raiding. All resource icons taken from Travian help files. I play as roman, i too get less from raids.. teutons get all resources. romans have to play with less resource from raids ? It’s part of the challenge of playing Romans. They are formidable in the middle to the end game. Persevere and the Romans will prevail!